I'm not exactly sure, but I think it's "The Midget Bible." Tim Conway was in it. Ah, I bet she was talking about the Dorf on Golf videos. 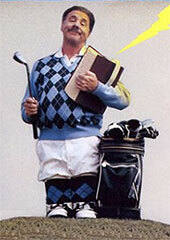 A quick search for dorf bible showed the title is Dorf's Golf Bible. Unfortunately, we don't have it in the catalog - actually, there were no Dorf videos in our consortium at all. She was a little sad, but not entirely surprised. I, on the other hand, got to speculate on the other possibilities for a "Midget Bible" for the rest of the day. *I know it's kind of just semantics, but people using the term video bothers me (and not just because it's ambiguous). But even moreso when people talk about "renting" things from a library. I think they know what they mean, but I believe that thought can follow speech, and not speaking accurately can lead to thinking inaccurately. But, I'm like that.